Howard Fuller, Ph.D., a distinguished professor of education at Marquette University, minced few words on Dec. 4 as he delivered the annual Barbara L. Jackson, Ed.D., Lecture at Fordham’s Lincoln Center campus. “I don’t believe that we’ll ever achieve any type of equity or even equality for the children of the families of the disinherited of America,” he said. A measure of justice is possible though, he said, and to get it he advocated for radical changes to public education. 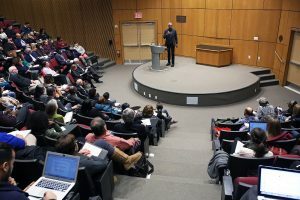 “We need to create new systems of learning opportunities based on a totally different governance and finance structure—one that puts all of this stuff in the interest of students first, allows dollars to follow students, and holds adults accountable for not having our students achieve,” he said. Fuller, the former public school superintendent in Milwaukee, said he is not against public education per se. And any system can be changed, he noted. Fuller noted that emancipation from slavery liberated blacks in the United States, but it did not make them free. Education was the key to freedom, because it is the only escape from poverty available to black children. It has been a struggle to attain it in the face of hostile forces ever since, particularly in the South, where schools for blacks were always inferior. “Black people in this country [are not]well served when they only have one option,” he said. But if there will never be equity or equality for all children, why fight? Fuller said he takes inspiration from Derrick Bell’s Faces at the Bottom of a Well (Basic, 1993), in which a woman is asked a similar question during the Civil Rights era. She answers that not to fight is to co-sign on the injustice. “Irrespective of whether or not I expect [people in power]to do anything, I can’t let them act like this is okay,” Fuller said.